Few days back we showed you how to customize navigation buttons on LG G3 smartphone. Now today in this guide we’ll show you how you can easily change the Notification panel icons with some colorful icons. This guide is available for LG G3 D855 model only. Don’t try this method on any other variant of the LG G3 or any other phone of LG. All credit goes to the XDA member Kickoff, who comes with new mod for the LG G3 smartphone. With the help of this mod you can easily replaces the default icons in the quick settings panel with some colorful icons. The mod has two different version one for the 10e and other for the 10g software version. So before applying this mod on your phone do check your LG G3?s model number and software version in Settings > About phone. To apply this mod you need a rooted phone with Custom recovery, to root you device check out our rooting guide here or do the google search. The process is very simple and take a few minutes to apply this mod on your new LG G3 android smartphone. Download the Colorful icons flashable zip form the below mention links and move the folder on your smartphone internal storage to start the flashing process. Now boot your device in the recovery mode and and flash the file form the recovery menu and reboot the device to apply the change on your phone. 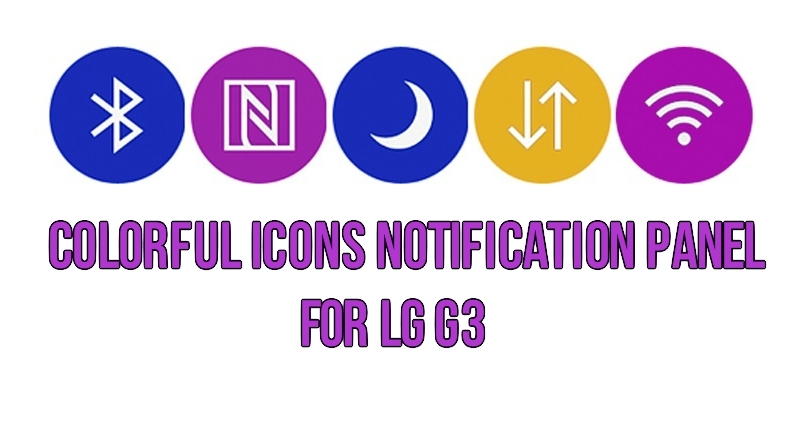 Now you will see the new Colorful Icons on your notification panel. The icons are stock but colorized. See the screenshot below. In case you don’t like the icons or facing some problem with the mod, you can always revert back to the original System UI by flashing the below mention file on your device.